Description: Given out as one of two options to Club Nintendo members who had reached Platinum status for the year 2012. 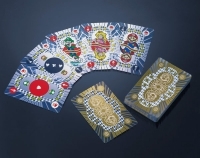 "This set of stylish, clear playing cards is made out of high quality plastic, and features special details like Mario™ as king, Princess Peach™ as queen, Luigi™ as jack, and more. Gold and silver colored artwork decorate both sides of each card for a cool metallic effect. These cards are an exclusive gift, only available to this year’s Club Nintendo Platinum members." 09-05-2013 Limeface Description Given out as one of two options to Club Nintendo members who had reached Platinum status for the year 2012. "This set of stylish, clear playing cards is made out of high quality plastic, and features special details like Mario™ as king, Princess Peach™ as queen, Luigi™ as jack, and more. Gold and silver colored artwork decorate both sides of each card for a cool metallic effect. These cards are an exclusive gift, only available to this year’s Club Nintendo Platinum members." 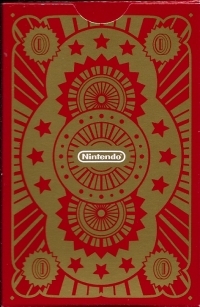 This is a list of VGCollect users who have 2012 Club Nintendo Platinum Member Reward - Mario Playing Cards in their Collection. 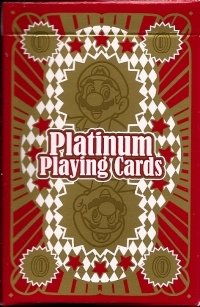 This is a list of VGCollect users who have 2012 Club Nintendo Platinum Member Reward - Mario Playing Cards in their Sell List. This is a list of VGCollect users who have 2012 Club Nintendo Platinum Member Reward - Mario Playing Cards in their Wish List.